Shown above - summer pool cover for heat retention and winter pool cover. The greatest heat loss from a swimming pool is from its surface due to evaporation. levels of chemicals and further lowers both costs and maintenance. A summer cover is used purely for heat retention. Centigrade increase in heat retention with the use of a summer pool cover overnight. 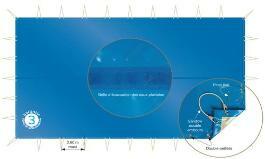 Winter swimming pool covers provide protection from debris during the winter months. to open the pool again for the coming season. A roller is not required. complete with attachments and stainless steel fixings for terracing. of security for your swimming pool in France. 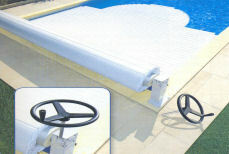 easily fitted to most new and existing pools. Le Banc - lies boxed on margelles at one pool end. Imm'ax - lies rolled up flat at one end of your swimming pool.